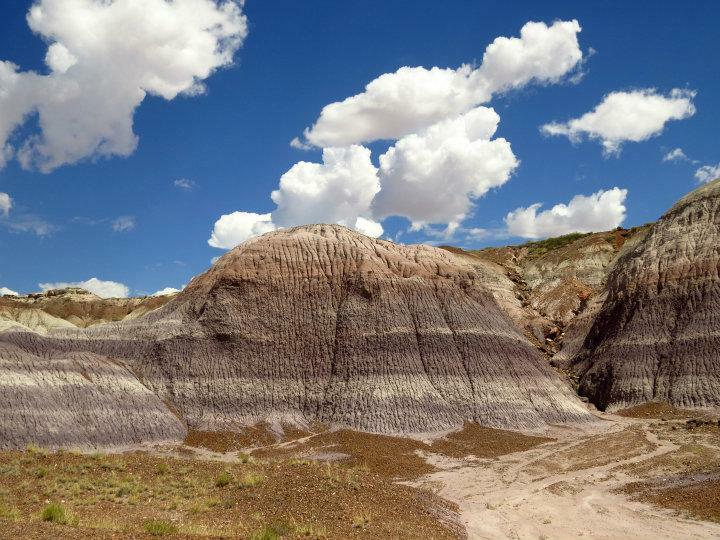 Our final stop is the Petrifed Forest which is really so much more. No tours needed for this. It is a 28 mile drive with frequent stops for scenery, hikes and snap shots. It has to be one of the most beautiful stretches of road in the world. The road is paved, thankfull, unlike our two previous stops, and by entering from the north, at the end, we are a few minutes away from I 40, our only interstate on the entire trip. One important aspect of this spot is Route 66. People have been basically using this same path for hundreds of years - Natives, the Spanish, settlers, trains, tourists. Most of 66 is gone because of the interstate except for a stretch west of Flagstaff but some telephone polls remain in the park, along with the torn up sections of the actual road. We find NM far prettier an AZ but this stretch is unbelievable. The scenery changes every few miles. From the riot of reds and pinks in the Painted Desert to the white and mauve in Mesa Canyon. The number of petrified wood/rocks visible in the landscape increases as we headed south but the appearance is anti-climatic to their surroundings. And, there is an ancient Puebloean site, too, with some excellent rock carvings. We head about an hour west, to Winslow, yes, the Eagles' Winslow, AZ. Our friend Jim Duncan introduced us to this town years ago. The main attraction is one of the few remaining Fred Harvery railroad hotels in the US, La Posado. It is in the midst of a massive restoration and we were pleased to see lots of progress since we were here in 2006. Trains run right behind the hotel and it was pleasant to hear them rumble thru in the middle of the night. This was a major stopping point as people traveled cross country, before commercial flights were common. Howard Hughes often visited here and, therefore TWA, his airline stopped here, too. A myriad of celebrities slept here, too and their names and bios are outside their rooms. If you come, ask for The Mary Colter room, she was the architect and designer of the hotel, because it is one of two rooms with a usable balcony, the other being the Bob Hope room next door. Mary also designed many other building for Fred, including some at the Grand Canyon. She was way ahead of her time, as a woman and designer. One of the owners is Tina Mion, whose quirky, and we love quirky, art hangs in the public areas. Sadly, the town is old, tired and has lots of abandoned buildings. With that, we will come back to stay here next year, just to see this great hotel again. I could go on and on about what makes this place so special. If you want more info, google Fred Harvey, the hotel, Mary Colter and Tino Mion. FYI, other than the rowdy bikers a couple of table from ours, the restaurant is terrific. We are sorry we did not spend two nights here. One more blog before we depart on the 26th.